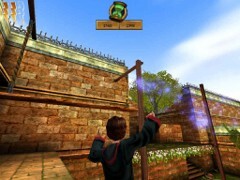 [5.1] Harry has to go see what this dueling is all about. Go up and leave the Hall of Floating Stairs. Go to the Entrance Hall, and down the stairs turn left where Ron is still waiting for Harry. 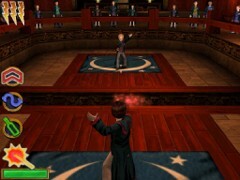 I started Dueling Club to defend yourselves. 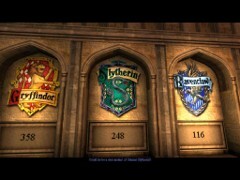 Dueling Club meets every day in the antechamber just outside the Great Hall. 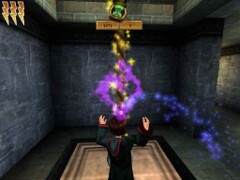 To select a spell, scroll through them by using the space bar or the right mouse button. 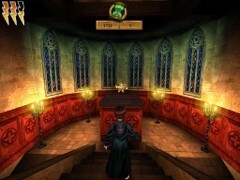 To cast a selected spell on your opponent, press the left mouse button (or: ALT). You may build up the strength of Rictusempra and Mimblewimble by holding the button down. 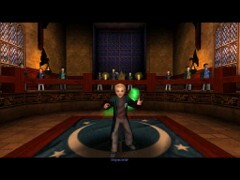 Gilderoy ends: Note that Potion drinking and jumping during duels are prohibited. A pledge of Bertie Bott’s Every Flavored Beans is required to duel. The victor wins the opponent’s Beans! To challenge a student to a Duel, simply walk up to them. If you have enough Beans you will be invited to duel. Harry wants to duel with Ron, but Snipe thinks it’s time to split up the dream team and orders Malfoy of Slytherin to duel with Harry. After the Duel Malfoy casts an exotic Snake Spell on Harry: Serpensrtia!. Everyone is in shock. 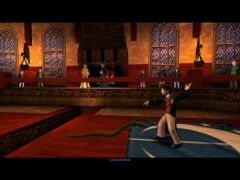 But Harry commands the snake: Leave me alone!. And Draco Malfoy says: It couldn’t be! Not him! 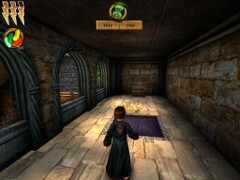 [5.2] Ron, Hermione and Harry run out of the Great Hall. Ron:You’re a Parselmouth, Harry. You can talk to snakes! Hermione: It matters, Harry, because being able to talk to snakes was what Salazar Slytherin was famous for. ...could he be the descendent of Salazar Slytherin? Next morning, Harry meets Ron and Hermione downstairs. Hermione won’t be seeing Harry in Herbology class. I’ll be in Moaning Myrtle’s Bathroom working on the Polyjuice Potion! Ron can’t believe Hermione is skipping class. Well, we better get outside to Herbology, Harry. Come on! 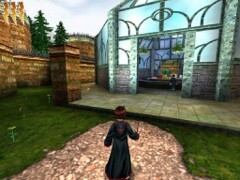 Harry needs to get to his Herbology class outside in the greenhouse. Follow Ron outside along the alley to the right of the Dragon Statue. There’s a guy trading Flobbermuke. Watch your amount of BB. Beans. You don’t really need it for now. 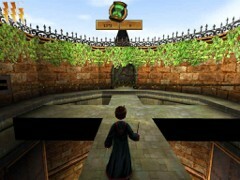 Harry enters a small courtyard with a birch tree and a chest in the corner. Cast Alohomora on it and get some Flavored Beans. The fellow on your left doesn’t trade. Follow Ron in front of the Greenhouse. Before entering turn left and open a chest in the corner of the garden. This contains bronze Wizard Card #5: Gulliver Pokeby, 1750-1839 Expert on magical Birds. First open a chest for a bronze Wizard Card! Now enter the Greenhouse. Welcome to second year Herbology, everyone! Prof. Sprout is digging right in. I’ll teach you Diffindo, the severing Charm. By now you already know how this exercise goes. You may earn up to 15 points for Gryffindor. You have learnt Diffindo, Harry! Now let’s move on to the Diffindo Challenge! [5.3] Welcome, Harry, to my Diffindo Challenge! You know the kind of Challenge Harry’s up to. 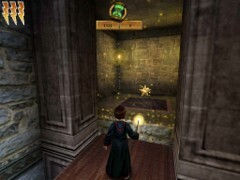 Harry is starting in a courtyard and the Completion Star can be found in a hallway just above him. 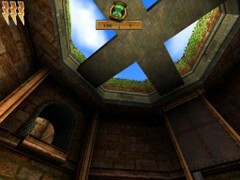 Some vines and plant growth can cover doorways and openings. You can use Diffindo to cut through them and clear Harry’s path. You’ll start off with 1,500 seconds and there are 14 Challenge Stars to be captured! It seems to get harder with every Challenge. THE COURTYARD WITH THREE SNAILS. 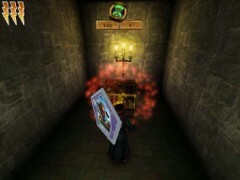 Cast your first Diffindo on the vine blocking the entrance to a chamber. You may as well jump through one of the side windows. In this room you’ll find a chest to your right. Alohomora! Add some Beans to your purse. 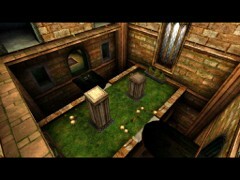 Follow the corridor inside a room and cast Flipendo on the big flower-pot in the middle of a table right in front you. This pot contains some Beans. Turn around and cast Alohomora on a chest and Flipendo on a cauldron standing a bit farther in the room. They both contain more Beans. 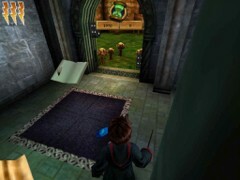 Cast Alohomora on the door with a Rose pattern left of the cauldron, and find a chest inside a secret chamber. Cast Alohomora and get some extra Beans. Turn around and look at a door opposite to the chamber. It gives access to a courtyard with three Giant Orange Snails that may attack a lot faster than the ones you’ve met before! The first Snail is “patrolling” under an arcade in front of the door. Wait until it passes by the door (preferably from the right side) and stun it with Rictusempra. Run inside and immediately turn left in the arcade and notice the vine in the corner. Cast Diffindo on the plants and a Snail plate is unveiled. Pick up the Beans around the plate and go stand with your back to the wall. Wait until the Snail approaches and when it notices Harry it will attack and stumble on the plate. That will unlock a first barrier of the exit door in the other arcade. Let the Snail come out away from Harry. Turn left and follow the wall to the corner of the courtyard where you will see two cactuses and a bench. Harry is safe in this corner. Turn around and observe the scene from this position. See that flower-pot and watering-can left in front of Harry? Cast Flipendo on the pot and twice on the can for some Beans. A second Snail patrols along a path around the tree. This one is very aggressive. Where the path meets each arcade two signs on the wall attract attention. Wait until the garden Snail slides away from the corner of the path and approach the corner. If it turns around, it will attack. So quickly cast Rictusempra on its back and stun it – for a while. Come closer to the wall, cast Flipendo on each of these signs and keep an eye on that Snail. You must watch it after each Flipendo. If it wakes up, cast Rictusempra to stun it again. 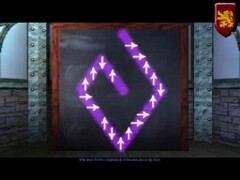 When all four signs are shot, a door to a secret chamber will open. The chest inside contains your silver Wizard Card #70: Leopoldina Smethwyck 1829-1910. Wait coming out of this room until the garden Snail has turned its back on Harry or stun it when it hasn’t. Come out, turn left and run into the second arcade. Cast Rictusempra on the patrolling Snail of this arcade if it is shuffling toward the corner with the vines. Otherwise leave it. Cast Diffindo twice on these vines and take the beans. Once again, stand with your back to the wall and wait on the Snail to attack. When it hits the plate, the exit door will fully unlock. 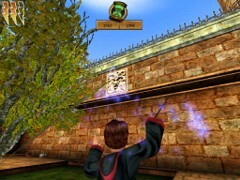 The camera view heads toward a sparkling rope behind a Save Book. 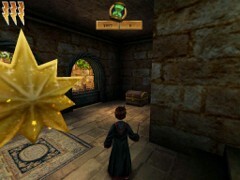 Acquire your first Challenge Star and chase the Choc Frog. Go up and pass the Save Book. [5.4] Cast Diffindo on the rope. A draw-bridge gives access to a small garden with gaps on the sides, a sort of an island. Proceed and turn right, and listen to Prof. Sprout: Horklump Mushrooms can give off a cloud of poisonous gas, Harry. Avoid them, or use Diffindo to cut their stems. So let’s do it by the book of Mrs. Sprout first. Cast Diffindo each of the 7 Horklumps that block the entrance to the island, and walk up to them. 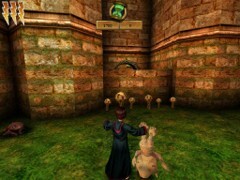 Harry picks up a Mushroom head: Once you have separated a Horklump from its stem, you can pick it up and throw it. Throw the head to the two Horklumps further on your right. In a similar way decapitate the three Mushroom on your left. Throw a third Mushroom to the Gnome behind the leaves. He’ll fall into the hole leaving 3 Beans behind. Cast Diffindo on the vines and grab the Beans. Jump down to the corner ledge of the front gap and take the Beans. Down there you’ll notice a room with a chest. Do not open! Peeves is hiding in there! Ascend from the other side and collect the Beans. Now there’s another way to deal with these Mushrooms here that Mrs. Sprout forgot to tell you all about. Of course, why would she? After all she’s got a fine job and a steady income at Hogwarts, now hasn’t she? But Harry can always use some extra Beans, he’ll need them badly later on! 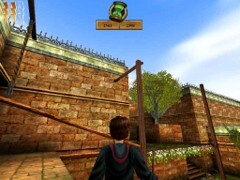 [5.4] (bis) Harry is standing on the bridge. 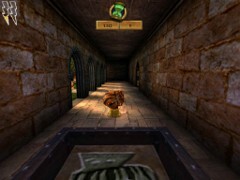 Rather than casting Diffindo on the Horklumps turn left (or right) and jump to the corner of the gap. You’ll end up on a high ledge. Collect all Beans while going down. Enter the hidden room but leave the chest alone. Why? It contains Peeves! Ascend from the other side grabbing all Beans on the way up. Now Harry is standing on the island. 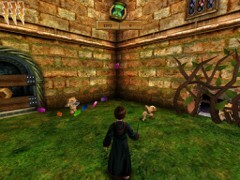 Cast Diffindo on the vines in front of the Gnome hole and release the Gnome. He will start eating all the Mushrooms turning them into Bertie Bott’s Every Flavored Beans! When he’s finished stun him with Flipendo and throw him where he further belongs: in his hole. Now all the extra Beans are yours! To the opposite side there is a bottomless void. Through the grilled window in the draw-bridge you’ll see a Challenge Star. That bridge has got to lower! On each side of the bridge there is a tall alcove with a sparkling rope. Each rope allows one of the lowered blocks on the island to elevate. Cast Diffindo on each rope and lift a lower and a taller block. (Tip: If you want to save on time go stand on the left platform and cast Diffindo on the left rope from here. You’ll be going up with the block and you won’t need the smaller block to jump from). Jump from block to block to the opposite ledge with the BB. Beans. Collect all the Beans on the narrow ledges and enter the dark room. Cast Diffindo on the rope that lowers the second draw-bridge. Grab two Beans in there and jump down. Cross the bridge and earn your second Challenge Star. 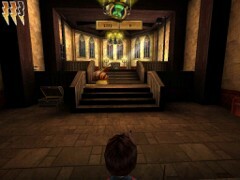 Go inside the Chapel and immediately stun a Corrush Pixie. To your left cast Alohomora on the chest for your bronze Wizard Card #12: Merwyn the Malicious, Medieval. 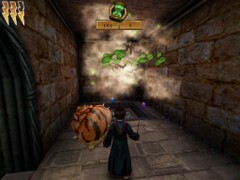 Stand in front of the stairs and Stun a second Pixie and the Giant Orange Snail, both with Rictusempra. Walk up the four stairs. Turn right and cast Alohomora thrice on a small chest on the table. Enjoy some Beans. On the opposite side is a bottle with Flobberworm Mucous. Cast Flipendo and grab the Muke. Go up the second staircase and cast Diffindo on two ropes that are attached to a moveable square block with a Flipendo sign on it. Cast Flipendo thrice on the block and a door to a Star slides open behind Harry’s back. Take the Star and follow the corridor. On your right you’ll see a table with a watering-can and two flower-pots. Cast Flipendo on the larger pot for a couple of Sweeties. Next to that is an alcove with a tin soldier. Cast Flipendo twice on him for more Beans. Enter the opposite room. Prof. Sprout says: Spiky Prickly Plants shoot their spikes when you get too close. Avoid them or use Diffindo to cut their stems. Cast Diffindo on each of the three SpiPri Plants. Look up and you’ll notice a concrete cross above Harry. In fact this room is a low octagonal open tower. There are two windows in the walls. Cast Flipendo twice on the tall block with the sign on it, and it will move in the direction of a wall with one of the windows. Climb the block and pull up to the window with the green Bean. Cast Diffindo on the rope. A sort of service elevator platform is then activated. Jump on it when it passes. Ride up and jump off upstairs, and cast Diffindo on the vines. Walk over the cross and cast Diffindo on the rope crossing the entire width of the tower. That will open the way out of the Tower. 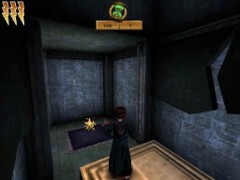 Proceed along the cross to the next vine and cast Diffindo to clear the entrance to a room with a square hole. Take four Beans and jump in. Restore your stamina with a Chocolate Frog. You’re standing in the second window now. Jump down and take the exit to your 4th Challenge Star. Diffindo can be used to cut other things too, Harry. Try it on that Spider Web. [5.5] Flip the cauldron for some Beans. Cast Diffindo on the spider web and run to the suspended wooden bridge. Turn right and cast Diffindo on the rope that locks the swinging bridge. When the giant swing floats forward cast Diffindo on the opposite spider web and jump to that side. Crush the spiders on the floor and acquire your 5th Challenge Star. Notice a hole in the floor next to a wall fresco with a rose pattern; keep that in mind. Go left and cast Lumos on the Gargoyle. 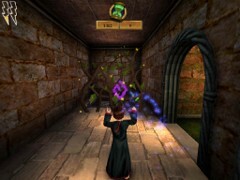 This Lumos Spell charms two different walls. Turn right and follow the stairs up to a wooden bridge suspended from one rope, and grab 4 Beans on the way up. 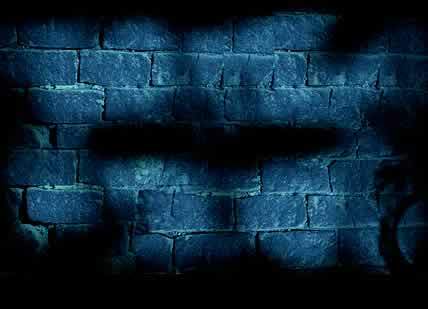 Follow the bridge till the end where you’ll see a first wall charmed by Lumos. Go inside the room and grab the 6th Challenge Star. Return to the bridge, cast Diffindo on the rope and the bridge (with Harry) will drop one floor down. Turn away from the Gargoyle and meet your 7th Star. 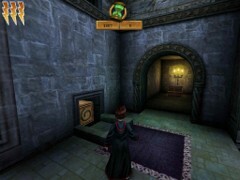 Turn right past a red and a green Bean and step through a second wall charmed by Lumos where you’ll see a chest. Cast Alohomora and acquire bronze Wizard Card #18: Uric the Oddball, Medieval. Go left up the stairs and grab 4 Beans. Turn right and watch a block with a Flipendo sign in a hole similar to the one you saw below. Cast Flipendo on the sign and push the block down. Return downstairs past the transparent wall and cross the bridge on your left.. Turn left of the Gargoyle and watch the block lying in the hole next to the patterned wall. Cast Flipendo on the block and it will trigger a switch that opens the wall. Inside is a chest with a silver Wizard Card; cast Alohomora on it. Get your silver Card #8: Derwent Shimpling, 1912-present. Cross the bridge again and turn left. Cast Flipendo on the cauldron in the corner and get some Beans. Watch the Snail, stun it if necessary. See these three pots on a shelf? Cast Flipendo on the middle one and get a couple of Beans. 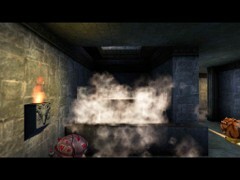 Skurge the Ectoplasms – the one on the wall and the one obstructing the cube with Flipendo signs on its faces. There’s a Choc Frog behind the block if you need one. Cast Flipendo on the Block and it will move towards the wall. Climb it and jump from the block to the ledge. Grab the blue Bean and immediately stun a Cornush Pixie with Rictusempra. Go up four stairs and Skurge the floor blob. Jump over the gap, grab a colored Bean and turn right. In the shaft you’ll notice a block suspended from a rope. Stand on the block and cast Diffindo on the rope. 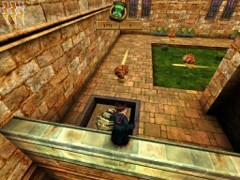 The block will drop on the cracked floor, tremble for a while, and break through ...with Harry on it! Turn around and behold your 8th Challenge Star. Turn left and cast Rictusempra on two Cornush Pixies in a row. Run and jump over the three ledges. When you land on the first ledge they all start slowly sliding in and out the walls. On the opposite side, flip the cauldron for a blue Bean and save by the Book. [5.6] Look inside past a row of Horklump Mushrooms by the entrance to a garden. 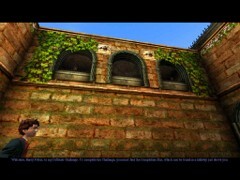 See the vines obstructing Gnome holes in the side walls? Don’t waste Diffindo on any of the good Mushrooms, they’re Colored Beans in another shape, remember? Run and jump over the barrier of Horklumps, a little damage won’t hurt. There’s a Choc Frog inside the garden anyway. Cast Diffindo on all three of the vines in front of the Gnome holes and let the Gnomes take care of the Mushrooms while you’re nicely watching. Meantime crush these nasty spiders that keep climbing Harry’s back all the time. Each Gnome can only eat a limited amount of Mushrooms. Sometimes you may push a bit though. Stun one of the Gnomes and throw him to the row of Mushrooms you want him to devour. When all Mushroom are gone, cast Flipendo on each Gnome and throw them into their holes. Now you’ve got plenty of Beans to harvest and no scratch at all! Jump on the ledge and go down to the garden of Tentaculas. That is a Venemous Tentacula. Don’t let them get near you, their bite is very nasty! 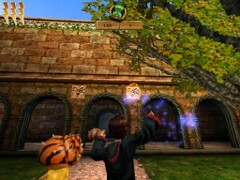 Diffindo can be used to both stun the creature and sever its arms. Stun the First Tentacula with Diffindo and quickly pass it. Sever the arms of the next two permanently. Aim carefully at the arms and cast Rictusempra. There’s another Choc Frog near the birch on your right should Harry need one. Go left to the corner and open a chest with Alohomora for more Beans. You’ll hear some strange grunting coming from upstairs, while branches are being thrown at Harry. Ignore all that for now, it’ll soon be explained of what to do. Sever an arm of the Tentacula guarding the staircase, go up and take your 9th Challenge Star. Turn right, run and jump to the opposite ledge. Bowtruckles are tree Spirits that guard Wiggentrees. Cast Diffindo on them to make them disappear, says Prof. Sprout. Each Spirit will leave a Wiggentree Bark behind. Always look for it. Get rid of two Bowtruckles with Diffindo. Watch out for these Spirits. 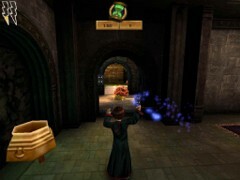 When Harry is aiming Diffindo and a projectile hits him before the Spell has affected, he will loose the Charm and get hurt. Search the Wiggentree area for Bark left behind by each of the Bowtruckles and look up to a bright sign on the wall. Cast Alohomora on the sign and the panel swings open. But how to get all that high? Look at the suspended plank on your right. Cast Diffindo on the first rope (on your right) and turn the plank into a footbridge: a ramp leading upwards to the narrow ledge on the wall. Run and jump again to the overgrown catwalk…oops, that won’t work in the opposite direction. Follow the stairs again, run up on the footbridge and climb the narrow edge on the wall. Grab a Bean and run inside the opening you’ve just created in the wall. The first thing you’ll see is a shelf with two pots and a watering-can. Cast Flipendo on the middle pot for Beans. Proceed left and take a blue Bean from the floor. Cast Flipendo on the larger pot on the shelf for more Beans. Turn around, grab the yellow Bean an cast Flipendo on the bottle with Flobberworm Mucous. Grab the Muke, turn around and follow the track with Beans to your next Star. Take your 10th Challenge Star and cast Alohomora on the chest behind it. Acquire your silver Wizard Card #85: Blenheim Stalk, 1920-present. You are in a Hallway looking down on the previous garden. Take some time for that. Return to the ledge and turn right, grab a purple Bean and jump down. You’ll end in a corner with a flower-pot and a watering-can. Cast Flipendo on the pot and twice on the can for more Beans. Cast Diffindo on each of the ropes from which the next footbridge is suspended and it will drop down and connect the ledge and the next overgrown catwalk. At the end of the catwalk turn right and climb the ledge. Ignore the watering- can in the corner for now and climb the higher section with the two Bowtruckles and the Wiggentree. Cast Diffindo on each of the Spirits and grab their Bark. Look down from the corner into a third garden with Giant Orange Snails and SpiPri Plants. Go down to the corner and cast Flipendo twice on the watering-can for extra Beans. Should Harry have lost some of his stamina and you haven’t eaten all two Chocolate Frogs below, you may prefer to go down again and eat them before saving by the book. [5.7] From up the stairs look down at some plant growth on a Snail plate and cast Diffindo on it. Stand left of the plate and wait on the attack of the Snail. It will push itself on the plate and you’ll see a first barrier of the Chapel door unlock. Cast Rictusempra on the Snail, that’ll keep it dizzy for a while and proceed to the next corner. Stun the second Snail somewhere along this lane and stay close to the wall in order to avoid some prickling spikes that the SpiPri plants would launch. If the third Snail is far enough from the next corner cast Flipendo on the bottle on the floor and get some Flobberworm Mucous out of it. Then run to the Snail and stun it with Rictusempra. Promptly proceed past the second overgrown Snail plate and jump to the dividing wall for a change. You’ll get some nice view. Should the Snail be near the corner cast Rictusempra on it and then get the Muke out of the bottle. Proceed and jump to the wall behind the second Snail plate. From your position on the wall cast Diffindo on the plants above the plate. Let the third Snail approach. As soon as the Snail notices Harry it will try to attack and step on the plate of its own, just like always. The door to the Garden House is now entirely open. Let the Snail slide away and jump down. Watch the Garden Snail. Turn around the corner and cast Diffindo on the SpiPri Plant and run inside to your right. The door seals off behind Harry. Immediately look up at the ceiling and cast Alomohora on a bright sign. That opens the ceiling and unveils a suspended platform with a Challenge Star. Cast Diffindo on the rope that holds the platform and it will drop to the block below, together with the Star. Jump on the block and seize your 11th Challenge Star. Jump down and descend on the left side of the stairs. Grab a Bean and cast Skurge on the Ectoplasm. Cast Diffindo on the branches and enter. 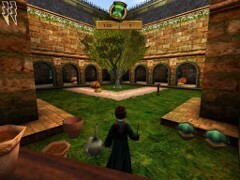 A Bowtruckle is locked up between three doors of branches. Cast Diffindo on a second set of branches and wait until you see the Bowtruckle and cast Diffindo on him. Take his Wiggentree Bark and turn right where you’ll be blocked by another door of branches. Cast Diffindo and proceed. Cast Diffindo on the spider web and crush the spiders. Turn left and cast Diffindo on a second web to clear the staircase going up. Take a purple and a red Bean and cast Diffindo on a third web. Take a Yellow Bean, crush the spiders and turn right where you’ll see an open door to a Challenge Star. Go inside and take the 12th Star. 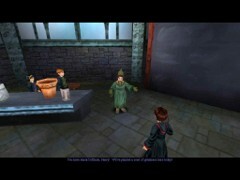 Cast Flipendo on the cauldron for more Sweets and return all the way down to the chapel. On the other side of the stairs go down to a Gargoyle and grab the Bean in front of him. 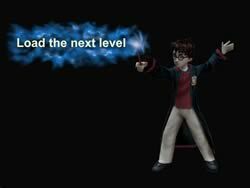 Cast Lumos on the Gargoyle and quickly run all the way up. See anything? Me neither, so apparently that Gargoyle merely brightens Harry’s path. Upstairs turn left and cast Diffindo on each rope that blocks a mechanism. Now two ledges will combine to a bridge above the pit. Continue till the rose pattern. Cast Alohomora and a chamber is unveiled. Cast Skurge on two blobs on the floor. Jump all the way down and open the chest with Alohomora. Collect your bronze Wizard Card #49: Elladora Ketteridge, 1656-1729. Turn around and cast Skurge on a last Ectoplasm. Climb up and turn left. You’ll be entering a small garden with 3 Tentaculas. Sever all their arms with Diffendo and grab the Beans. Go out and find Challenge Star #13. Cast Flipendo on the cauldron for some Beans, turn around and crush the spiders that arrive. Cast Alohomora on the rose pattern next to the spider web and a corridor with another spider web opens. Cast Diffindo on that web. On your left is a chest. Alohomora! Obtain bronze Wizard Card #21: Lord Stoddard Withers, 1672-1769. Go outside and cast Diffindo on the web. Go down the stairs. There isn’t any Bean in the pots and watering-can on the shelves, so cast Diffindo on the spider web. Go further down and grab a Yellow Bean and eat the Choc Frog. You’ll probably need it. The bigger pot on your right contains some Beans. Cut the web with Diffindo and crush the spiders. Turn right and flip the cauldron for a purple Bean, then save. [5.8] Stun the Snail with Rictusempra and cast Lumos on the Gargoyle. That will cast a spell on a part of the wall opposite to the entrance and some ledges above the Courtyard with three Snails. Cast Flipendo on the pot for Beans and eat the Choc Frog. Cross the ledges while picking up some Beans and go inside. Here you find the last and 14th Challenge Star. Then a door closes inside and A Snail appears out of the blue. Stun and push it into the hole. The door slides up again. Turn right and take the Bean. On your left there is an “S” lightning sign in the wall. Cast Alohomora. The are four Beans on the floor and a Snail plate. Go out of this room and proceed till a door closes and 3 Snails appear out of nowhere. Two Snails are near a Snail hole with a pattern of two Snails it. Push them inside and a new area opens. Wait for the third Snail to approach the “S” room and cast Rictusempra. 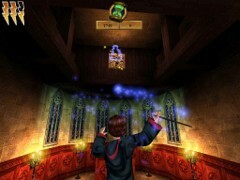 Then cast several Flipendo to push it on the plate inside the room and a secret wall opens behind it. Inside is a chest. Cast Alohomora and acquire silver Wizard Card #87: Thaddeus Turkell, 1632-1692. Leave and proceed till the corner with the purple Bean. In the next passage there is a bench with 3 pots. The middle pot contains Beans. 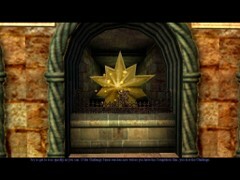 Pass the door on your left with the final Challenge Star to another bench with a pot and a can. Cast Flipendo on the pot for Beans and take the Frog. 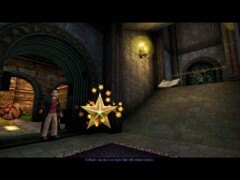 Enter the Hallway with the final Star and open the chest on the right with Alohomora for obtaining a last bunch of Beans. On your left cast Flipendo on a bottle with Flobberworm Mucous. Now take the final Challenge Star. Congratulations, you’ve completed the Diffindo Challenge. You may always come back here and improve your score. If you do, all Horklump Mushrooms will have fully grown again, so you will get more Beans out of them. Also the 5 Bowtruckles near the Garden Chapel will have risen each carrying more Wiggentree Bark. Play it again and improve your score! It’ll render Harry rich and immortal!